Evotaz (atazanavir + cobicistat) is a fixed-dose combination antiretroviral drug used in the treatment of HIV. The two components of the drug are individually marketed as Reyataz (atazanavir) and Tybost (cobicistat). The single-pill co-formulation allows for easy, once-daily dosing, with the cobicistat component effectively boosting concentrations of atazanavir in the blood. Doing so increases the drug's ability to suppress the virus over a longer period of time and reduces the risk of drug resistance. Evotaz was approved by the U.S. Food and Drug Administration (FDA) in January 2015 for both new and treatment-experienced adults with HIV. Evotaz comes in a film-coated oblong tablet, each of which contains 300 milligrams (mg) atazanavir and 150 mg cobicistat. 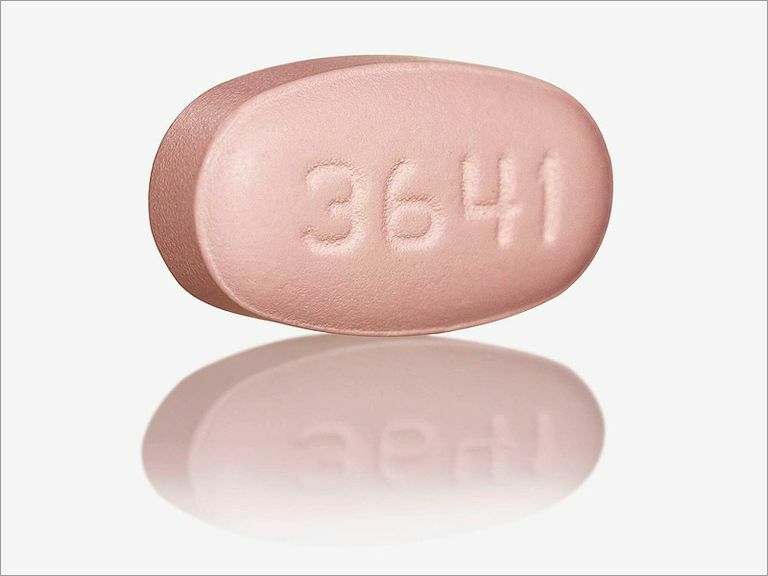 The tablet is pink in color and embossed with the numbers "3641" on one side. One tablet is taken daily with food. Evotaz cannot be used alone but must be taken in combination with one or more antiretroviral drugs. Before starting, patients should be tested to assess their estimated creatinine clearance as Evotaz can potentially impair renal (kidney) function, most often in patients with known or undiagnosed renal dysfunction. When coadministered with Viread (tenofovir)—a drug which may cause renal impairment in some—it is recommended that patients be tested for estimated creatinine clearance, urine glucose, and urine protein. It is also recommended that treatment-experienced patients, particularly those exposed to HIV protease inhibitors, be provided genetic resistance testing before being prescribed Evotaz. If genotypic testing is not available, Evotaz should be avoided for anyone previously exposed to HIV protease inhibitors. Less common side effects include fatigue, headache, insomnia, vomiting, and upper abdominal pain. Kidney stones were also noted in some patients when Evotaz was coadministered with Viread (tenofovir), although the cases were considered mild and did not result in treatment discontinuation. Antacids with aluminum or magnesium hydroxide can prevent Evotaz from being properly absorbed. If you are using an over-the-counter antacid, such as Rolaids, Tums, or Milk of Magnesia, it is suggested that it be taken either two hours before or after a dose of Evotaz. Proton pump inhibitors, such as Losec, Prilosec, Prevacid, Nexium, Pariet, can similarly block absorption of Evotaz. It is suggested that they be taken either 12 hours before or after a dose of Evotaz. Decrease Viagra to no more than 25 mg in 48 hours. Decreased Levitra to no more than 2.5 mg in 72 hours. Decrease Ciais to no more than 10 mg in 72 hours. Crixivan (indinavir) should not be coadministered with Evotaz. Intelence (etravirine) should not be coadministered with Evotaz. Sustiva (efavirenz) should not be coadministered with Evotaz. Viramune (nevirapine) should not be coadministered with Evotaz. Selzentry (maraviroc) dosage should be adjusted to 150mg twice daily if coadministered with Evotaz. Inform your doctor of any renal (kidney) condition or hepatic (liver) condition you may have before starting Evotaz. This includes such viral infection as hepatitis A, hepatitis B or hepatitis C.
H2-receptor antagonists used to block stomach acid (e.g., Tagamet, Pepcid, Axid, Zantac) can also block absorption of Evotaz. It is suggested that they be taken either with Evotaz or, alternately, 10 hours before or after a dose of Evotaz. During pregnancy, Evotaz should not be prescribed during the second or third trimester, if the pregnant patient is taking either an H2-receptor antagonist or Viread (tenofovir) as there may be a risk of kernicterus (a rare condition that occurs in newborns with severe jaundice). Bristol-Myers Squibb. "Evotaz (Atazanvir +cobicistat) - FULL PRESCRIBING INFORMATION." New York, New York; accessed February 3, 2015.